Free Radical's '00s favourites will seemingly return. Old Free Radical series TimeSplitters and Second Sight have been acquired by publisher Koch Media, it was announced today. 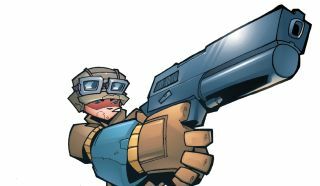 TimeSplitters was a cartoon-y early '00s FPS series that never came to PC, but Second Sight, a third-person shooter with awful box art where you had psychic abilities, did. It's noteworthy because the announcement mentions that "full details of future Timesplitters and Second Sight products will be revealed in due course". That makes me think some kind of remaster is on the cards, at least in the short term—and neither is likely to skip PC these days, even if TimeSplitters felt like it existed because consoles weren't too hot at emulating the PC-style FPS experience at the time. The developer once known as Free Radical is now owned by Koch, too: Dambuster Studios, who made the unremarkable Homefront: The Revolution. A PC-ready version of TimeSplitters 2 was actually hidden inside it. "We are hugely excited to have acquired Timesplitters," said Koch Media's Klemens Kundratitz in the press release. "The original games gave fans a massive content offer and provided a pure and genuinely fun arcade shooter experience. We have many fans of the Timesplitters series among our own staff who are passionate about creating a product that will thrill today's gaming audience." I remember enjoying TimeSplitters 2, and think it might have a place as a remaster on PC if it retains its splitscreen and co-op functionality, maybe with a bit of texture polishing. We've covered a PC remake project called TimeSplitters Rewind before, but its website hasn't been updated since December. Second Sight, meanwhile, wasn't particularly loved by the PC Gamer team back in 2005, earning 65%. "If feats of mind over matter were really possible, this game would be a lot better."